Mirror, mirror on the wall, which is the best lighted makeup mirror of them all? Either you had an eye closed, or your mirror didn’t do its job well enough. When you bought it (a few years ago, true), the ads promised it would give you the best light from your right side. And the overhead lighting was supposed to make sure your make-up is good to go in less than 5 minutes. What if all of the above is wrong, after all? What if, instead of doing good, your lighted makeup mirror is of no use…? You know that a good lighted make-up mirror has to light up well, to be functional, to give some form of magnification and, why not, be aesthetically pleasing. But how much light should a good lighted makeup mirror give? 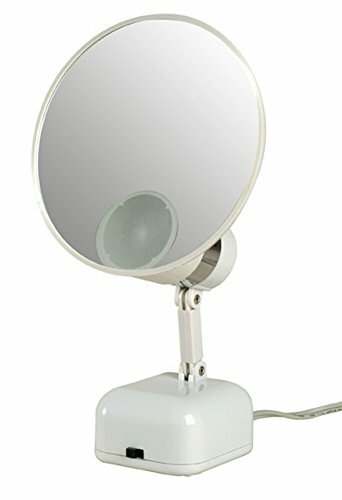 How much magnification should the best mirror for make-up have? Studies have shown that if a lighted makeup mirror magnifies 10 times, then you never go out the door ever again- you’ll be spending too much time trying to hide and cover your skin’s imperfections. So, most of you out there would be more than pleased with a 5 times magnifying makeup mirror. And about the light… Look for a lighted make up mirror that has no less than 80 CRI- high color rendering index. This is supposed to work miracles when it comes to the perfect balance in your makeup. Avoid overhead lighting only and don’t go overboard with the wattage; even though strong light seems perfect, well…it’s not. Unless you are on a stage all the time. A good lighted mirror will give you a soft light that’s not amazingly bright, and will have multiple light sources. Of course, it would be great if your make up mirror would be sensor activated (it comes at a price, sure) and has suction cups (so that you can move it around your house or even take it when traveling). Led lighted or using a fluorescent bulb, battery powered or AC, there’s one thing sure: never go to sleep with your lighted makeup mirror on! Nothing matters more than your beauty. Nothing beats your efforts to look nice for yourself, to go out into the world all smiling and satisfied. 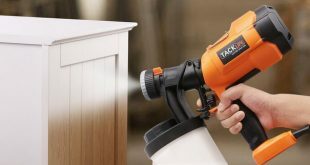 It’s written all over your face: you do like to change your lights all day long, you do like multiple angles when putting your makeup on, you do like to adjust the magnifier of the mirror as it pleases you. 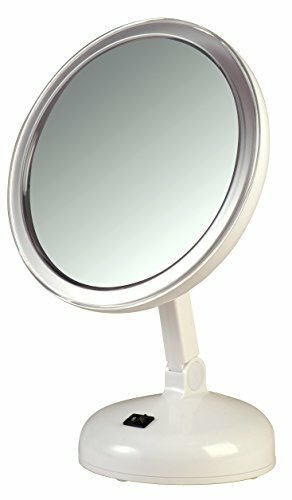 So, this is the best lighted makeup mirror for you then: it has adjustable magnification and it includes 4 adjustable settings for daytime, evening, home and office environments. If you are in a hurry and do not have time to insist, you can go for the 1 time magnification, if you want the extra special makeup (and have the time for it) you can use the 5 time magnification, so that every detail is in place. 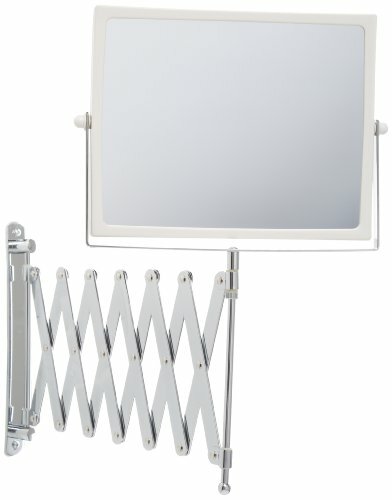 This quite large triple makeup mirror had 2 bright 9watt fluorescent light tubes and is very sturdy at the same time. 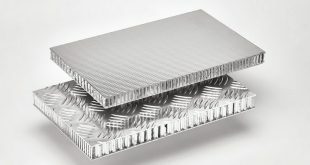 You will find that the large mirror , when flipped, will reveal the 5X magnified mirror and the multiple settings for the light will become more than useful. 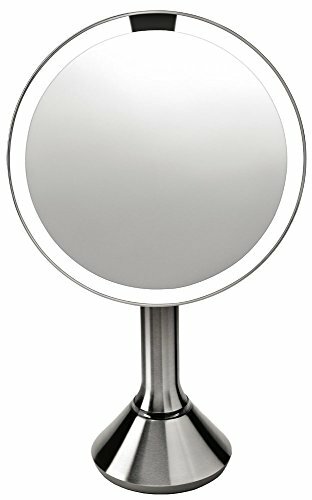 Coming with a 1 year warranty, this lighted makeup mirror seems to be a good, low price option when in need. 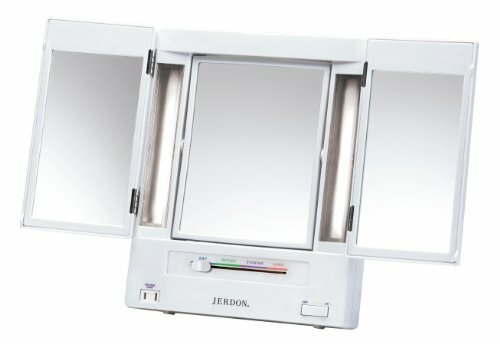 If you are looking for the best lighted makeup mirror, at a low price, we’re gonna give it to you straight: this is it! Giving you 5 times magnification, imported, delivered to you really quick, this lighted makeup mirror comes with 4 light settings also. It will help you with the perfectly balanced light no matter the moment of the day: day, evening, office and home. The side-view mirror panels will seek that you arrange your hair perfectly anytime and they will adjust for custom viewing. When traveling, they close so it will be easy to take the mirror with you. The wide-angle view provided by the 3 panels will come handy every time you do your hair. 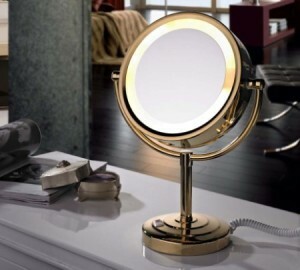 With its bright lights, clean design this lighted makeup mirror will make you even tweezing your eyebrows nice and lovely! When it comes to your lighted makeup mirror, you like to go fifty-fifty: working its ways when it comes to the best makeup and nice looking also. 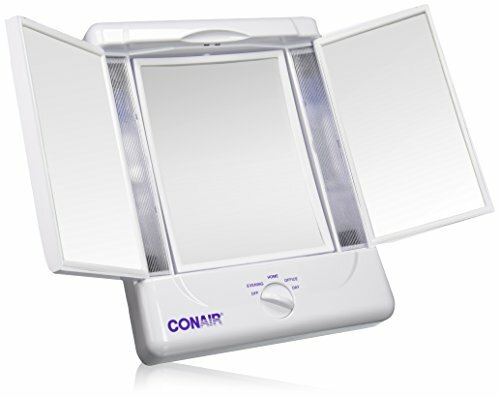 ETL listed, with a 5’ line cord, this lighted makeup mirror will give a soft halo lightning for a fog-free, clear viewing. The nice quality, the pretty color of the body, the oval design and the perfect brightness of the light make this makeup mirror with lights a great option indeed. Do you like to travel a lot and stay in nice hotels? Would you like to bring back from the nice hotels things that would give you the same sense of style and comfort? This is the lighted makeup mirror that you found in most of the nice, luxurious style hotels that hosted you for a while. Thank goodness that they put it on the market also. You’re not gonna have the perfect make up only when you travel! 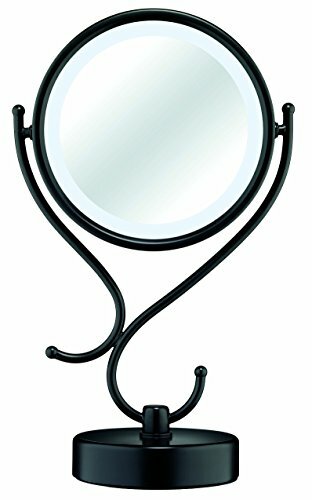 This wall mount mirror has a 14-inch arm extension and a matte, sleek nickel finish. Easy to install with its own screws, easy to move around, this lighted mirror expands up to 14’ from the wall, while maintaining firm enough to hold various, unexpected angles. Its smooth 360 –degree rotation recommends this mirror as a good, well priced option. Fog free, used in luxury hotels and recreational centers this lighted makeup mirror comes with a 1 year limited warranty also. 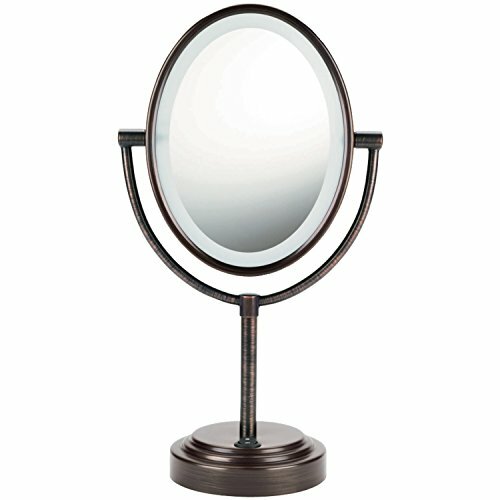 When in need of a well priced lighted makeup mirror just go with this one. Its T5 fluorescent bulb will give a bright distortion-free light, thus providing you the comfort of seeing all the details of your skin and still put on a great, natural makeup. This mirror uses white light and shows true colors. 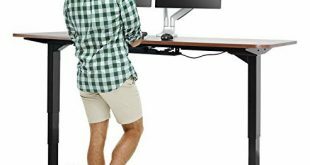 The adjustable angles will give freedom of moving it as it pleases you. Please note that the diameter is only 7,5”. 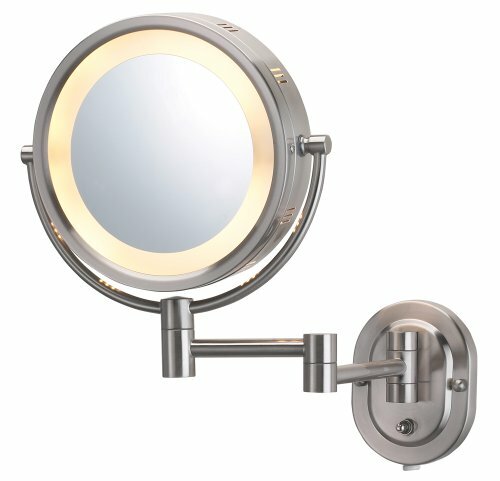 The lighted mirror has an on/off switch button (easy to find, on Base) and comes with only 110 Volts. The 10x magnification will be of great help when looking for all the details on your skin. 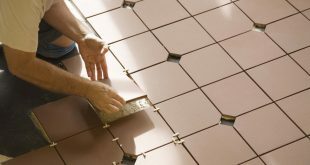 So you are the customer that not only cares about the utility of the product, but also cares a lot of its looks, how it will improve your room when the new purchase will arrive. When it comes to serving its purpose and looking nice, this mirror is definitely a sure thing. The 8” diameter lighted mirror will magnify 8 times helping you if you have eye problems or if you simply want to pay extra attention to the details of your skin. The energy-saving lifetime fluorescent bulb will give a nice, 30% brighter, natural light, while using 60% less energy comparing to other similar products. This mirror is double-sided and rotates 3500 for a standard view. Well built, sturdy this mirror has an on/off switch on its line cord. The matte black finish will close the deal. Who would resist to the elegant vine design? If you are looking not only for a lighted mirror, but also for an extendable one, then call it the day because this one will serve you wright for sure! The two-sided square mirror is a wall mount mirror and it will extend its scissor design arm up to 30 inches. One side of the mirror will give you a regular view while the other will magnify up to 5 x , thus helping you with the details and unwanted imperfections. The 360-degree swivel design will mean the world when doing your hair. The decent construction, the clarity of the mirror are completed by the sleek look and its convenience. 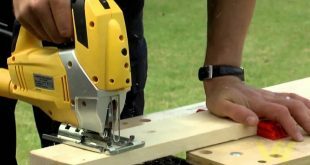 You will not have to worry about installing it; it comes with a complete mounting hardware and it is quite easy to do it on your own. This lighted mirror is so handy that it’s used even on hotels and it comes with a 1 year limited warranty. Are you the type who would go buy crazy priced products just to feel pampered and…find the best product for your needs? If so, your search is over: you just hit the gold mine J! If you are vane enough and want to spend some money on a mirror that is sensor-activated, this is the right purchase for you. Distorsion-free, with a very clear, high-quality glass, this mirror is has a back that is coated in high-purity aluminum, thus providing good reflectivity and clarity. You don’t have to worry about plug it in; it’s rechargeable and every 5 weeks you can recharge it using a standard USB port (it comes with its own cable and adapter). You can play as much as you want with the angles of this mirror; its maximum adjustability will permit moving up and down, tilting back fully, even while standing up. The tru-lux light system mimes the natural sunlight, though twice as bright and more true to the colors. The 9” diameter will only improve your skills when it comes to make up and finding the flaws in your skin. This mirror is cordless and its on/off sensor will help saving up the energy. If you are always on the run and don’t have time to change the side of the mirror to the magnifying one, with this one you will spare your time for sure! The only side is the 5x magnification side! The 5 year mirror warranty proves that this lighted mirror is a good investment for a very long time! After reading about high priced mirrors, you can lighten up! There is a very good mirror at a low price for you, also! This one has even three lighting effects and it will magnify not 5x, not 10 x, but no less than 15x so you can really work good on the unwanted details on your skin. Or, take your eyeglasses off and put a nice, natural makeup on with no worries for over doing it. Adjusting to various angles for an easy viewing, this mirror comes with only on the bottom lights. After 10 years of use, there were customers who were still using the original bulb. This 6,5 inch mirror is not only efficient, but also small: in price and diameter! Is organizing your thing? Then, this mirror is just your luck! It’s not just a lighted mirror, it comes also with an organizer for your makeup tools! 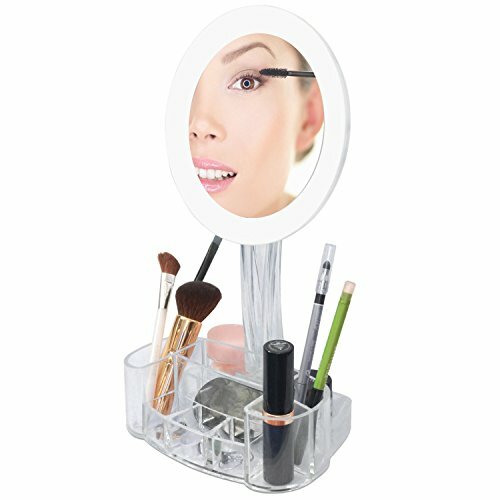 Fully adjustable and easy to obtain any angle of viewing, this mirror comes with a clear acrylic makeup organizing base. The 9 compartments will help you save space for your cosmetics, hair accessories and even your jewelry. The led ring will provide you enough light and will require 3 AAA batteries.